At FLOAT: Chinese Medical Arts, Nutritional Consultation / Dietary Therapy is included within the cost of any follow-up treatment (not at the initial visit). As Licensed Acupuncturists, we are trained in both Western Clinical Nutrition and Traditional Chinese Nutrition. We emphasize eating real food, avoiding processed foods, and cooking for yourself and your family whenever possible. We use an integrated approach to help each patient discover which foods are best for their specific constitution, their Chinese Medical and Western Medical diagnostic patterns, and their health goals. Traditional Chinese Nutrition looks at the effects that particular foods have on the individual, rather than on a scale or in a test tube. If a patient is suffering from a "heat" condition, for example, foods that have a cooling or neutral effect on the body may be recommended; if a patient has suffered heavy blood loss, foods that build up blood will be recommended. At the follow-up visits after your first Nutritional Consultation at FLOAT, your acupuncturist will check in with you about how it's going with your diet and answer any questions you may have. For our regular patients, we also provide ongoing support via email. 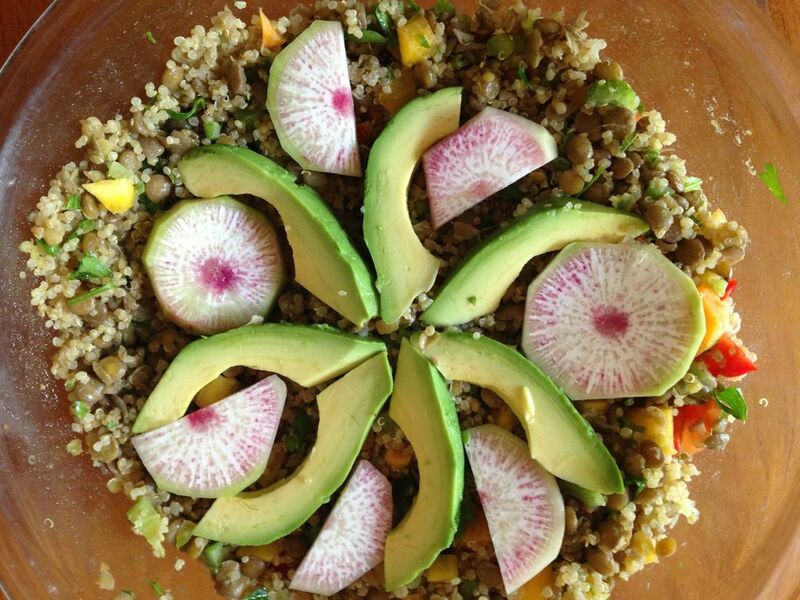 Lentil Quinoa Avocado Salad with homemade bone broth and vegetables from Abigail's garden.